June 14, 2018 Dan O. More guns. In America. Great. Dr. Paul Kersey (Bruce Willis) is a surgeon living with his wife and daughter in the fine suburbs just outside of Chicago. However, just when he thinks it’s safe enough to live peacefully with his family, a bunch of bad-guys come into his home, rob it, and shoot his wife and daughter. The wife dies, the daughter survives, but Dr. Kersey is not happy at all about this and won’t stop until he finds out who did this. In order to extract revenge the way he sees fit, he’ll have to gain a love for guns and take to the streets, getting rid of all the senseless, violent crime that’s being done by people who deserve to be thrown in jail, but have been constantly avoiding the authorities for quite some time. But with Dr. Kersey around, they won’t be able to run and hide any longer. In today’s climate, it’s not at all a surprise that a remake of Death Wish didn’t work. The original, while about a challenging topic and character, still feels as if it leans more towards on the side of being a grind-house, action-flick that likes to shoot a lot of people and have you cheer for it, ask questions later. Which for the 1970’s, was fine. But considering that this is 2018 and public-shootings have become something of the norm around these parts, it’s hard to really expect there to be no questions asked whatsoever, or even all this much senseless gun violence. Where’s Ashton at to get in on this action? 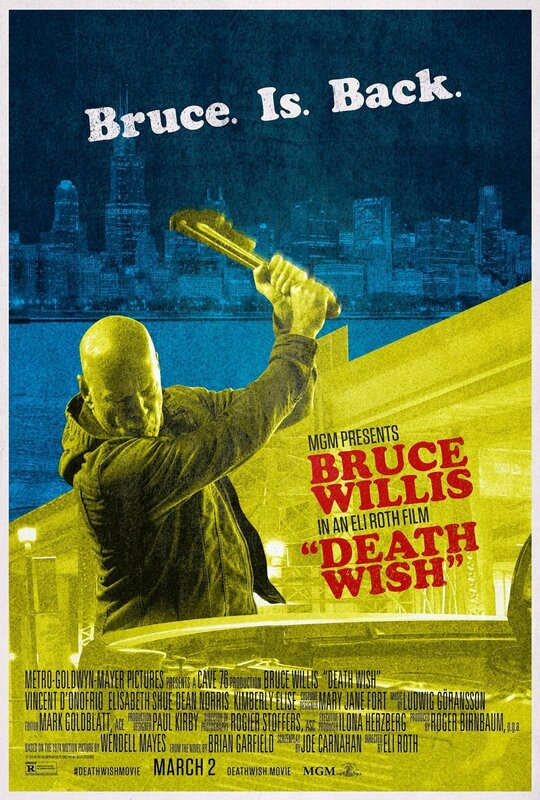 And yet, Death Wish is still a movie that exists and done by some pretty talented people, like director Eli Roth and writer Joe Carnahan. The two have made some pretty solid movies and if anything, they were the reasons why I even bothered with this one, but it almost feels like their daring, somewhat risky sensibilities, were tamed-down to appease to a larger-audience and it does not suit them well. Whenever it seems like we’re going to get something of a discussion about this vigilante going off and killing people randomly in the streets, the movie cuts away the investigation, or another scene of possible violence that’s supposed to cause more discussion, yet doesn’t. This happens an awful-lot and you wonder if there was ever any intention to really talk about this at all. If anything, Death Wish proves to be a remake that’s neither silly enough to be entertaining, dramatic enough to be disturbing, and/or smart enough to really make you think. It’s just a movie that sort of sits there, doesn’t do much, wiggles around a bit, shoots guns, makes loud noises, rocks out to AC/DC, and ends. One of these two guys made a bad movie. Who am I surprised the most at….? Case closed. Game over. When can I get my check? And it’s disappointing to say all of that because Roth’s a talented director who, when given the keys to the kingdom, can genuinely make magic and fun happen. You almost feel that with a smaller-product on his hand, and without a sort of brand-name to work with like the remake to a 1970’s-classic, that he could have let some of that magic work again, but he’s too tied-down here. There’s some of his usual antics with blood and gore, but believe it or not, with this kind of movie and by how dull it is, it’s just senseless. It’s like someone who puts up posters of his favorite bands, movies, or athletes all around their cubicle – it’s still a boring space, you’ve just added a little pizzazz to help yourself out. Consensus: To be honest, the Death Wish remake never had a shot in hell of working, but it’s never as fun, as thrilling, or as interesting as it should have, or needed to be, in order to make something work. “Do you feel lucky, punk? Well, do ya? :” Wrong movie, I know, but who cares, really? And that is another bad film we can add to Eli Roth’s never-ending list of terrible movies. Has he ever made a decent film? Nope. Roth has zero talent. I don’t understand the appeal!